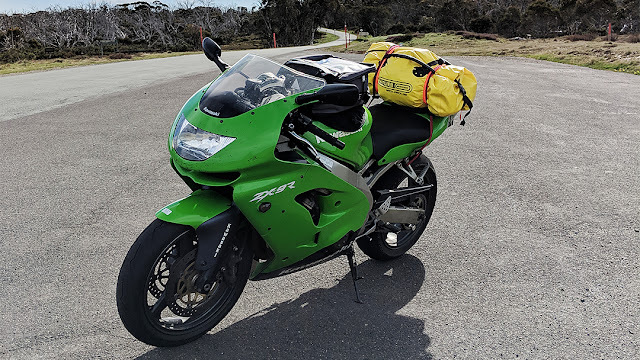 So last Sunday I decided to make something of my weekends, from now until the end of Summer I was going to spend as much time on two-wheels with mates out doing road trips or camping. To start off I planned the next three weekends going away camping with my partner in crime. First stop, Rawson. I chose Rawson for a couple of reasons, it was less than 200kms from home. There's a bar on site and a half decent road to ride on once you got off the freeway. I checked the weather report on Saturday morning and it was forecast for 1mm of rain but the sky in Melbourne was blue so we decided to grab breakfast and have a late start. By 11.30 we had the bikes packed and we were set to head off. The first part of the trip was along the Monash for 130kms or so of boring freeway. Half an hour into our trip the blue sky turned to grey, then the drizzle started which eventually turned into rain and lots of it, well over the 1 mm forecast. After about an hour we pulled into a servo and put on some wet weather gear (better late than never I guess), filled up the bikes and grabbed a coffee to warm up a little. Once off the Monash, there are about 30 kms or so of twisties starting from the town of Moe which we did our best to enjoy despite the rain. Ten mins out from Rawson the rain finally cleared and there were glimmers of sunshine poking out from the clouds which were a welcome relief. We pulled into Rawson Caravan Park early arvo and grabbed our key for the site. Each one has its own en-suite that has a toilet and shower it's also handy for storing your wet gear for the night. There's also a fire pit, not that we used it as everything was soaked. We had planned to explore some of the roads up around Walhalla and Lake Thomson Dam but after a chat with the owner, he suggested we give it a miss in the wet. So we opted for the Stockyard Pub instead, a short 20 meter walk from our camp. Rawson Stockyard Bar & Bistro is like a big barn fitted out with lots of old farming memorabilia a pool table and plenty of places to sit and catch up on the days events. The service was friendly and relaxed, the bourbons cold and the chicken parmi was easily one of the best I've had. You won't leave there feeling hungry that's for sure. After dinner we headed back to camp for a bit of Netflix and chill, lucky there's good mobile reception out there. Next morning we woke to the sound of kookaburras and sunshine, made ourselves a coffee before packing up and heading home. By this time the road had pretty much dried up and we got to open the throttle up and enjoy the road back before the freeway. This was a much better end to the weekend than waking up with a hangover with nothing to show but an empty wallet. Can't wait until next weekends camping trip, hopefully, it will be a lot dryer.